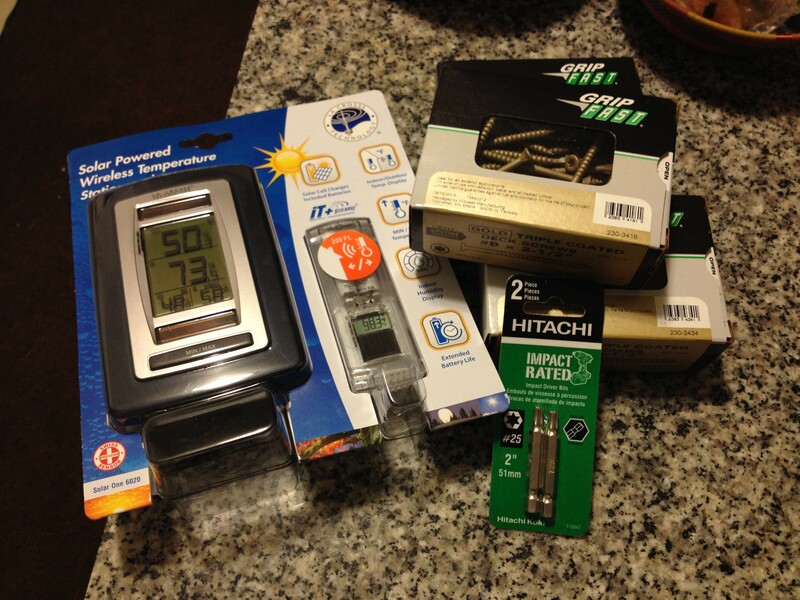 Our first purchase: some screws and a weather sensor. T-minus six days … and then we start building the chicken coop! 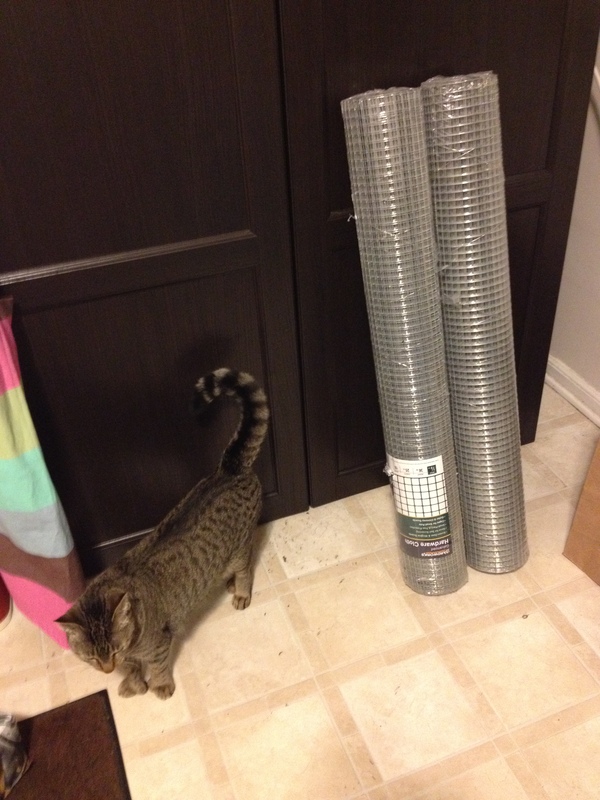 We’ve spent a bulk of the weekend buying materials. Even though I have a detailed list provided by the Wichita Cabin Coop designer, the task at hand is daunting. So far we have purchased screws, wood stain (color: Natural Sequoia), a paint brush, wood glue, hardware cloth mesh, 45 paving stones for the foundation and a shovel. My favorite purchase is a solar-powered remote temperature sensor that will allow us to monitor the inside of the coop in winter months. Cora checks out the hardware cloth mesh. She’s unimpressed. The largest task is before us today: to purchase all of the wood. Almost 130 pieces in all, ranging from 2x4x8’s (we need 50 of those!) to a 1x8x6 for the ramp leading into the roosting house. We’re guessing it will take at least two trips to Home Depot to get all of it home. And then, that’s when all of the work begins. Since the forecast calls for rain Monday through Thursday, we will put all of the wood into the basement. There, I will be able to stay dry while staining every piece of wood. I imagine this process to be tedious and long, but my boyfriend Matt is much more hopeful. I’m grateful I have a suitcase full of ’80s music (cassettes!!!) down there to listen to as I paint away. During the week, we will have to pick up what’s left of the list: assorted tongue and groove floor boards, wood for the nesting box, door and window hinges, brackets … and a green tin roof! Our friend Eric, who will help us build the coop, plans to arrive around 8 p.m. on Friday. We will break ground Saturday morning.